Ferries from Swinoujscie travel north to the port of Ystad in Sweden with Unity Line or Polferries, and to Trelleborg with TT Line Ferries. All Swinoujscie ferries can be booked quickly and easily with AFerry. Below you can find Swinoujscie ferry times, as well as our best deals. Facilities onboard TT Line ferries include bars and restaurants serving a varied selection of freshly made delicacies, different types of cabins furnished to the highest standards, lounges with panoramic views of the Baltic Sea, various entertainment and leisure facilities and duty free shopping. Swinoujscie (meaning "the outlet of Swina") is located the north western Poland at the mouth of river Swina opening into the Baltic Sea. 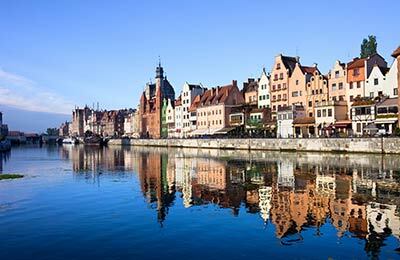 Swinoujscie is situated mainly on the islands of Uznam, Wolin and Karsibor unlike any other Polish city. The island of Uznam is the town's main tourism island well known for fashionable spas and bathing resorts including salt springs and therapeutic mud baths. If you catch a ferry from Swinoujscie, visit the fabulous Spa Park which is 170 years old, a neo gothic "Stella Maris" church famous for its picturesque stained glass windows, the tallest lighthouse on the Baltic Sea and many other fine resorts spread across the town's islands. Swinoujscie ferry port is the largest and modern ferry terminal in Poland providing passenger and freight sailings to many destinations. Swinoujscie ferry terminal is equipped with all the facilities for the passengers. The ferry port of Swinoujscie is well connected to the European route E65 running across from Sweden to Greece. The road connections to the port of Swinoujscie are very good from both within Poland and from Germany, just across the border. From Szczecin, drive on road no.10 for 7 miles and turn right onto S4/E28 and drive for about 17 miles. Then take road no.3 or E65 and drive 37 miles to Swinoujscie - Wolin until you reach the city centre and follow the signs to the ferry port. 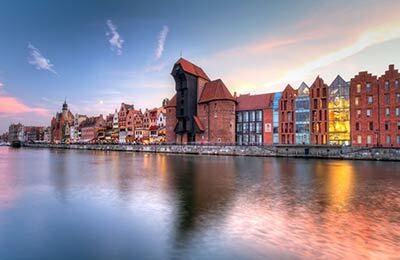 From Berlin, drive on E28 all the way to Szczecin and follow the above directions from Szczecin. Swinoujscie has four railway stations, on Wolin Island with regular regional connections to Szczecin and long distance connections to other Polish cities. The railway station is just minutes away by foot from the port and general rail links are very good. The Odra Railway connects Szczecin and Swinoujscie with western and southern Europe. Whichever company you choose for your Swinoujscie ferry journey, you will find booking easy and straightforward with AFerry.